*Dilly Dolls*: I left my brain back in October! I swear, there must be something in the water! I keep on forgetting to do things, including announcing the release of the full color selection of My Pet Spider boots! As stated above, the full color set is now available at the main store! They are still 100% original mesh, and fit all standard sizes, system and mesh feet! As usual, there are 12 colors to decide from. If you grab a single pair, you have the option of hiding or showing the spider. 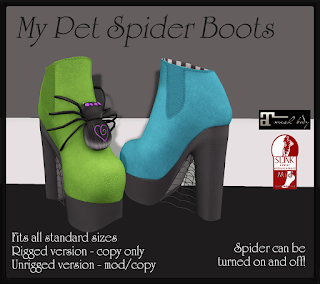 The full pack includes all 12 colors, the ability to hide or show the spider, as well as the ability to change the texture on the boots or spider or both! Be sure to try a demo before you purchase!